When FileMaker Inc. released the FileMaker 16 Platform last year they included a feature I had been requesting for over 15 years – native cURL support. cURL is a command line tool and library for transferring data with URLs – you’re probably familiar with the HTTP, HTTPS, FTP and SMTP protocols. cURL is important as it allows us to interact with external web services/APIs directly from FileMaker Pro, FileMaker Go, FileMaker WebDirect and FileMaker Server. For example we can use FileMaker to send an SMS, upload an Invoice to Xero or MYOB, or download Orders from eCommerce platforms like WooCommerce or Shopify. running scripts under FileMaker Server required the plug-in to be installed on the server, which can be done easily as long as the appropriate permissions have been granted in the FileMaker Server Admin Console. Some hosting providers also disabled the option to install plug-ins on shared servers. With the release of the FileMaker 16 platform came the ability to specify one or more supported cURL options as a calculation when using the Insert From URL script step, as well as the ability to specify a variable as the target (no more fields required!). This was a game changer as far as working with APIs was concerned – now the entire FileMaker Platform could natively make HTTP requests, set HTTP Headers, and encode JSON data and parse JSON. All of our integration solutions were using the BaseElements plug-in, so we started to work on adding native support for FileMaker Pro v16 users by switching from the BaseElements plug-in functions to using the native Insert From URL script step, cURL options and JSON functions. One function for which there was no native equivalent was the BE_HTTP_Response_Code function which returns the HTTP response code value from the last request. HTTP Response Codes are issued by the server in response to a request and can be used to determine whether the HTTP request was successfully completed or if there were issues associated with the request. For example 200 is the standard response for a successful request and 401 means there was an authentication issue and the request failed. It’s important when working with APIs to check the HTTP Response Code to confirm that the request was processed successfully – the documentation for each API will usually specify what response code indicates a successful request (typically 200 or 201). The response code we are after is the “403” value and not the “100” value, so our above calculation would return the wrong response code in this situation. We started working on a custom function that would look for the last “HTTP/1.1” string and then get the code following this, but that failed pretty quickly when working with a server that included the string “HTTP/1.1” elsewhere in the response headers. but unfortunately the -w option is not one of the FileMaker supported cURL options, so for now you’ll need to parse out the response code until FileMaker add support for the -w option. We’ve added this to the FileMaker Product Ideas discussion area – if you would also like to see this feature in a future version of FileMaker platform you can vote up the idea here. 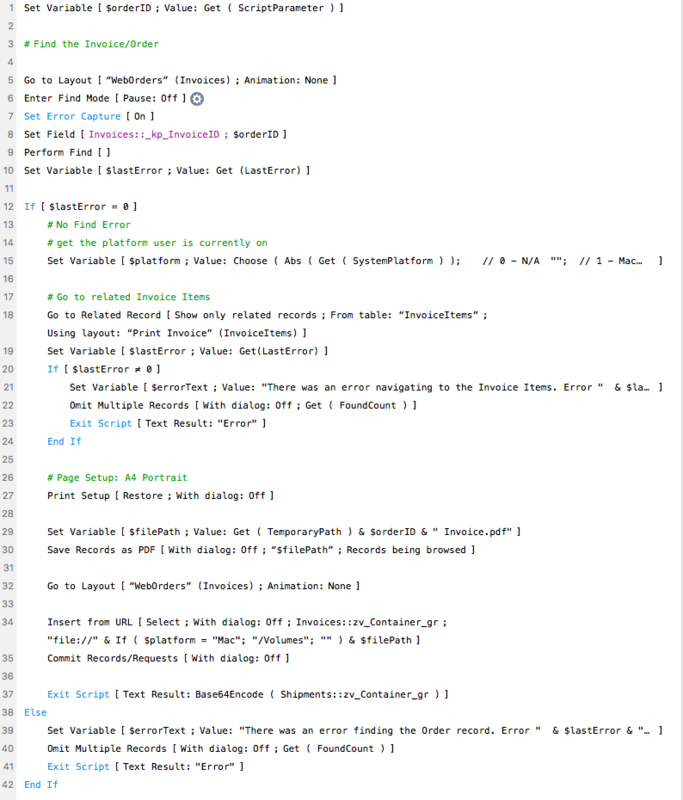 When we first released fmEcommerce Link (WooCommerce Edition) back in 2016 the functionality required to integrate with the WooCommerce REST API did not exist in the current version of FileMaker Pro, therefore we had to use a FileMaker Pro plug-in to handle the API requests, set HTTP Headers, encode JSON and parse the JSON response. This allowed fmEcommerce Link (WooCommerce Edition) to run under FileMaker Pro v12 and later, as well as under FileMaker Server with the plug-in installed, however it prevented it from running on FileMaker Go which does not currently support plug-ins (except via the iOS App SDK). With the release of the FileMaker 16 platform we got a number of new functions and script steps, including support for working with JSON data and being able to specify supported cURL options with the Insert From URL script step. These new features meant that we were no longer dependent on plug-in functions and we could replace these with native FileMaker features. We’re pleased to announce that v1.5 of fmEcommerce Link (WooCommerce Edition) is now available and includes a number of new features, including native support for FileMaker Pro v16 and later. This is a free update to all existing customers (simply download using the same link that was on your original order email). 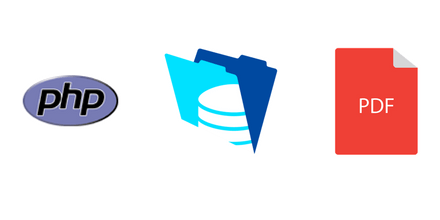 We’ve updated all the requests for downloading and uploading to the WooCommerce API to use native FileMaker functions and script steps so you no longer need to use a FileMaker plug-in if you’re using FileMaker Pro v16 or higher. This means you can also use fmEcommerce Link on FileMaker Go natively (requires FileMaker Go 16) – we’ve also included an example for using Perform Script on Server to have FileMaker Server handle uploading a Product to WooCommerce. In working on this update (which was a much bigger update than we anticipated and took much longer than we planned!) we tried to avoid making too many unnecessary schema changes. We’ve simply updated the scripts to check which version of FileMaker Pro, FileMaker Go or FileMaker Server is being used and if you’re using v15 or earlier we simply use the previous plug-in functionality, and if you’re using v16 or later we now use native functionality. Everything works exactly the same regardless of which version of FileMaker Pro you’re using, but we can now include support for FileMaker Go as well as having one less dependency to worry about. You can get all the details on our version history page – we’re busy working on adding native FileMaker 16 support to our other products, as well as some further updates to fmEcommerce Link (WooCommerce Edition) including support for uploading Orders from FileMaker to WooCommerce. Each of these methods have their pros and cons: for some users the FileMaker PHP API integration is not an option, and for others they aren’t able to connect remotely to the SQL database as this is blocked by their web host. Downloading CSV files each day/week is also time consuming and cumbersome. Fortunately there is another method to use that has many advantages over these methods: the Gravity Forms Web API. Using the Gravity Forms Web API we can dynamically query Gravity Forms from within FileMaker to check for new form entries and download those directly into our FileMaker solution, all within a few seconds. If you’re using FileMaker Pro v16 you can also use the new native JSON and cURL features to do this without requiring any FileMaker plug-ins – for older versions of FileMaker a plug-in is required to handle the API requests and cryptographic requirements. You can also setup schedules using FileMaker Server to have new form entries downloaded automatically (hourly, daily etc). If you would like to discuss integrating Gravity Forms with your FileMaker solution please get in touch for a free initial consultation to discuss your requirements. FileMaker Server 16 (and FileMaker Cloud 1.16.0) included a new trial feature called the FileMaker Data API (application programming interface), which allows web services or applications to access data in hosted FileMaker solutions without needing any FileMaker client software to be installed. This is similar to the current XML and PHP APIs which have been around for over 10 years, however the Data API is a REST (Representational State Transfer) API which means you don’t need to use any particular programming language to work with the Data API. In their Product Roadmaps over the past couple of years FileMaker Inc. have indicated that they will be investing in the Data API in future releases of FileMaker platform. Whilst they have not included the XML and PHP APIs in their list of deprecated features their focus will be on the Data API which opens up the FileMaker platform to an almost unlimited number of external apps and services. We’ve been working with REST APIs for many years – sending SMS messages, integrating with Accounting platforms and eCommerce platforms – so we were pleased to see FileMaker Server (and now FileMaker Cloud) include a REST API as this now opens up many possibilities for integration by external web services and applications, as they don’t need to know “FileMaker” in order to make requests with the Data API. If you’re familiar with making HTTP requests (GET, POST, PUT, DELETE) and working with JSON data formats then you will have no issues working with the FileMaker Data API. As the FileMaker Data API is a trial feature – the trial expires on September 27, 2018 and the Data API will cease to operate – we normally wouldn’t recommend our clients use this feature in any live systems as it is likely to change and you will have to upgrade to the latest version of the FileMaker platform before the trial expires in order to keep using it (after making any necessary changes to ensure compatibility with the final release of the Data API). There is also the issue of licensing – the Data API is currently free to use in the trial period, but FileMaker plan to have a licensing model in place before the end of the trial. Without knowing what the final licensing model will be makes it hard for clients to commit to using the Data API at this stage. During a recent project we had encountered a challenging issue that turns out was perfect for the Data API. This project has a FileMaker Server v16 hosted solution with a Custom Web Publishing/PHP interface. All users access the solution using a web browser – for security reasons installing FileMaker Pro was not an option. One requirement of the project was to allow printing of labels with barcodes and picking lists – we solved this by generating PDF files via the new support for generating PDF files on FileMaker Server as well as Excel files (see our blog post from last year on how we did this). We still ended up using a local FileMaker file to import the Excel file containing the data for the shipping labels and to create the barcodes. The process was also the same regardless of whether you wished to print a single shipping label or 100 labels. We had been discussing ways to streamline and improve this process, knowing that we couldn’t connect to the solution using a live FileMaker Pro connection. We were leaning towards building a integration using either the XML or PHP APIs, or using a product like RESTfm when we realised that the Data API might be another option worth considering, knowing that it was a trial feature and would stop working in September but would be a better long term investment. Now that FileMaker Pro v16 supports cURL and JSON natively it started to make even more sense, even though using FileMaker Pro to integrate with FileMaker Server via the Data API doesn’t make too much sense at first. we recommend using tools like Postman when working with the Data API to learn how to structure your requests. You can convert your working requests to cURL using the Generate Code Snippets feature which you can then copy and paste into your FileMaker Insert From URL script step and format for use with FileMaker Pro. See our previous article about about using Postman environments with the REST API. the Data API is not currently a complete replacement for the XML or PHP APIs. For example you cannot insert container data or run FileMaker scripts with the Data API, or retrieve metadata about your FileMaker solution such as layout schema. The Data API does not currently return data such as the number of found records like the getFoundSetCount() method does in the PHP API, so you need to use workarounds for these. date formats appear to work in a similar way to the PHP API in that you need to specify them in MM/DD/YYYY format regardless of your date formats on your server or FileMaker solution. Dates are also returned in the same MM/DD/YYYY format (e.g. 11/30/2017 for November 30th, 2017). when performing a find query the fields you are searching for don’t need to be on the layout you specified in your URL, but only fields on the specified layout are returned in the response. when performing a find query that results in no records found the use of the –show-error cURL option determines whether the Insert From URL script step returns an error (1631) or not. This is documented in the Supported cURL options page help page under the Handling errors heading. Using FileMaker Pro as a client for the FileMaker Data API has us thinking about new ways we can leverage the Data API from an offline FileMaker Pro or FileMaker Go client, such as syncing records when using FileMaker Go on an iPhone or iPad and removing the overhead of having to have a live connection to your FileMaker Server. The Data API is perfect for uploading or downloading small changes from an offline file and once the shipping version of the Data API is available in the next version of the FileMaker platform (and the licensing model revealed) we expect to see more widespread use of the Data API, particularly for offline files running under FileMaker Go. Databuzz is pleased to announce that Andrew Duncan recently passed the Developer Essentials for FileMaker 16 Certification Exam and is now FileMaker Certified in v8, 9, 10, 11, 12, 13, 14, 15 and 16. FileMaker 16 Certification is the official credential offered by FileMaker, Inc.
FileMaker Certification is your validation that you are hiring an experienced FileMaker professional who has technical knowledge of the complete FileMaker product line and has passed the “Developer Essentials for FileMaker” certification exam. Being a certified developer demonstrates to clients, peers and management that you’ve achieved an essential level of knowledge, experience and skills in developing FileMaker solutions. This is a free update for all existing customers. You can view the full release notes on our version history page. Our next update will include examples for working with Bills in MYOB and FileMaker. We’re also planning an update that will be ‘plug-in free’ for FileMaker v16 users, allowing you to use the fmAccounting Link (MYOB AccountRight Edition) solution natively under FileMaker Pro, FileMaker Go and FileMaker WebDirect without having to install and manage plug-ins. The FileMaker v16 platform introduced some new cURL options and JSON functions which will allow us to perform the same functions as the plug-in provides when using FileMaker v16 – earlier versions of FileMaker will still need to use the plug-in functions. If there are other features you would like to see in the core fmAccounting Link (MYOB AccountRight Edition) file please get in touch and let us know. FileMaker, Inc. today announced availability of the latest version of FileMaker Cloud, its cloud platform for managing and running custom apps that runs on the Amazon Web Services Cloud. With this release (1.16.0.55), FileMaker Cloud joins the FileMaker 16 Platform and it is available in the US, Canada, Europe, Japan and Australia. This release of FileMaker Cloud requires FileMaker 16.0 clients at a minimum – if you’re using FileMaker v15 clients you will need to upgrade to v16 in order to access hosted solutions on FileMaker Cloud 1.16.0.55. You can read the full release notes here. FileMaker Data API trial: Use FileMaker data in other popular apps and services with the REST-based FileMaker Data API in FileMaker Cloud during the trial period. Tableau Web Data Connector for FileMaker: Better visualize FileMaker data with the Tableau Web Data Connector for FileMaker. The connector uses the FileMaker Data API trial to provide integration with Tableau Desktop. FileMaker Admin API trial: Help manage and administer custom apps with the REST-based FileMaker Admin API trial in FileMaker Cloud. Create messages and script schedules, open and close apps, and more. OAuth 2.0 support for accounts: Simplify credential management with OAuth 2.0 using third-party authentication providers. Use existing Amazon, Google or Microsoft Azure account credentials to log in to FileMaker custom apps. PDF support: Generate PDFs of layouts and data from FileMaker WebDirect. Save and print PDFs of invoices, labels, badges and more, just like with FileMaker Pro. For more information on the differences between FileMaker Cloud and FileMaker Server check out our previous article on FileMaker Cloud as well as FileMaker Inc’s comparison between the two products. This release of FileMaker Cloud brings the ability to schedule scripts via the new FileMaker Admin API trial which was one of the missing gaps when compared to FileMaker Server. FileMaker Cloud does not support Custom Web Publishing with PHP and XML and FileMaker Inc. have stated that this will not be supported by FileMaker Cloud in the future – the FileMaker Data API will be the focus as far as API integrations are concerned so developers should focus their efforts here. If you’ve been doing Custom Web Publishing with the FileMaker PHP API and needed to generate a PDF report you haven’t had many simple options. You can use one of the available PHP PDF classes such as TCPDF or FPDF which require specifying x and y coordinates, fonts and text to output in certain positions on the page, or setup a “robot” FileMaker Pro client that runs in a loop looking for new jobs to process. If you look at the documentation for the Save Records as PDF script step you will see that is only compatible with FileMaker Server and FileMaker WebDirect and not compatible with Custom Web Publishing (CWP), which is used by the PHP API when running FileMaker scripts. At this point you might be inclined to assume that there is nothing helpful in these changes for CWP/PHP developers, but there is a way to leverage the Save Records as PDF support under FileMaker Server from a PHP page. The solution to this requires the Perform Script On Server script step (PSoS) which is CWP compatible. At this point it’s important to mention that PSoS does require the fmapp extended privilege to be enabled for your PHP/CWP users and their associated Privilege Sets. If your PHP users don’t normally access the database using a FileMaker Pro client then you may need to make some changes to your OnFirstWindowOpen script to limit their access (e.g. lock and hide the toolbar, navigate to a blank layout etc). as the basis for my CWP scripts with only a few minor modifications, such as setting and retrieving various script parameters related to the records I was creating a PDF for. The downloadFile.php script simply retrieves the container data (PDF in this example) and does a force download of the PDF file to the user’s downloads folder. You could also change this to display the PDF in either the current tab or in a new tab as required. 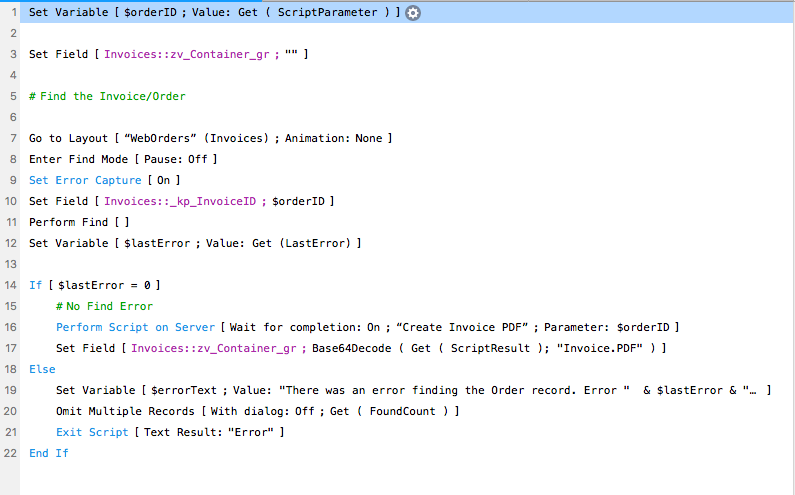 I’m setting the generated PDF into a global container field in the Create Invoice PDF script as I don’t need to store the PDF file permanently in the database as this can be generated at any time, however you could also store the PDF in a regular container field in a new record etc as required and avoid having to Base64Decode/Encode the PDF data. It’s also worth remembering that you can’t use the PSoS script to set the PDF into a global field, as global fields are unique to each clients “session” so the CWP script and the PSoS script are each running in their own session, which is why you need to use the Base64Decode/Encode functions. I’m looking forward to implementing this in existing CWP solutions which required complex FileMaker layouts to generate the PDF that weren’t easily created using the available PHP PDF classes. If you have any questions please leave a comment below.